What is a commercial driver’s license and why is it important in a truck crash case? ?What is a commercial driver’s license and why is it important in a truck crash case? ?How much does a truck accident lawyer cost? ?Are there laws preventing commercial truckers from driving distracted? Posted on 06/29/2017 A Truck Crash is Not the Same as a Car Crash, and Our Attorneys Know They Need to Be Handled Differently. 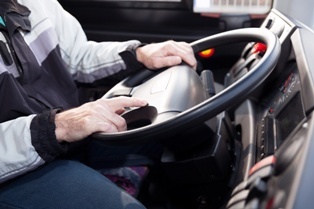 Drivers need special skills and comprehensive training to operate commercial vehicles. For this reason, it is illegal to drive a tractor-trailer, school bus, or other large vehicle without a valid commercial driver’s license (CDL). If a trucker is involved in a car accident and does not have a CDL, the driver’s employer can be held financially liable for penalties as well as the costs of the crash. Fault for a truck accident can fall on the truck driver, but also on the employer who failed in its responsibility to hire a safe, qualified driver. These duties include ensuring that drivers pass written and practical CDL skills tests, maintain their licenses, and do not drive on revoked or suspended licenses. If they fail to carry out their duties, employers can shoulder some, or all, of the financial burden of an accident. Proper classification. There are different kinds of CDLs depending on the type of vehicle driven as well as the type and location of travel. The 3 classes of CDLs have specialized qualifications depending on the weight of the vehicle (such as for driving tractor-trailers or tankers) and number of passengers (such as for operating school buses). If a driver involved in a crash has the wrong type of CDL, the employer may be held liable. Endorsements and restrictions. If companies require a driver to carry hazardous materials or oversized loads, the company is required to obtain the correct permits and driving endorsements for these journeys. Interstate travel. Federal law requires that CDL drivers must be 21 years or older in order to cross state lines, and must be 18 years or older to drive commercial vehicles within state lines. Employers must not allow underage truck drivers to perform journeys between multiple states. Driving safely and legally. Trucking companies have a responsibility to perform adequate pre-employment testing, including skills tests and screening for controlled substances. Drivers can lose a CDL indefinitely for using drugs or alcohol behind the wheel, and the trucking company can face action for allowing a driver who failed a drug test to stay on the active driving schedule. Hours of service records. Fatigued driving is a major cause of truck crashes, and drivers must be trained on hours of service rules and maintain logbooks that record hours driven. Companies that encourage the falsification of logbooks can face federal criminal charges and penalties. Our attorneys represent individuals throughout Illinois and Missouri who have suffered serious personal injuries, including those caused by commercial trucks. Simply fill out the short contact form on this page to schedule an appointment for a free consultation, or download your FREE copy of one of our books, When the Rules of the Road Get Broken: A Guide to Illinois Car Wreck Cases or The Missouri Car Crash Guide: Don't Wreck Your Car Crash Case! What Does it Mean When a Lawyer Offers a Free Consultation?